When I first arrived at Bobo Hill in Bull Bay, Jamaica, one of the oldest communities within the Ethiopia Africa Black International Congress (EABIC), my friends and I were greeted by one Priest Kassa. We were received into a small room where we were asked to remove our shoes, belts, hats, and contents of our pockets, and to tuck in our shirts. This act symbolized a cleansing from worldly attachments, necessary for the subsequent act of turning to the east in prayer. After his prayer, I explained to the priest my reason for visiting: I was researching views of the Rastafari on participation of whites in reggae music. Kassa immediately cut me off. "First ting: Rastafari is not reggae," he said. So I explained that I understood the difference, but that I am curious about what sort of cultural ownership is perceived among members of the movement from which reggae emerged, and I would especially like to hear the thoughts of those who do not hold reggae in a very high regard. When he could tell that I was not just some young reggae fan, but someone with a legitimate academic curiosity, he lightened up and notified two other priests who would also be interviewed. Then he led us to another room where he and a Priest Navandy shared a wealth of information and perspective about reggae and Nyahbinghi music. "The bass drum, which we know, is the breath, your breath. And that is the thunder, that what you hear roll in the heavens. The fundeh, that is the beat of your heart. And that is the earthquake. The kete now represent the lightnin’ – the repeater. Like how you see the lightnin’ flash, that is your meditation. So these three drums, when they play at one time, they connect to your spiritual and temporal." The priest is also a musician who primarily records Nyahbinghi music. 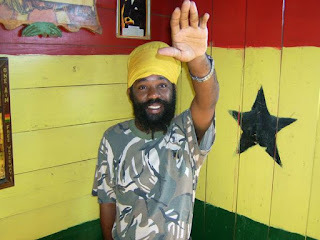 Some of his music, like the video below, is more like mainstream reggae, following the examples of his Bobo bredren, Capleton and Sizzla. Though it is not the divine music of the Rastafari, proper for Sabbatical worship, it is still "churchical" in terms of its lyrical content. I've taken a serious liking to Kassa's songs of the Nyahbinghi variety, which you can hear on his MySpace page. Until I can convince him to post more, enjoy those four. The one that gets stuck in my head a lot is "King David." One of these days, I hope to hear his explanation of the line, "King David is our God and King." Is David considered by the Boboshanti to be one of several incarnations of Jah (God)? This could make sense in light of the fact that, for the EABIC, the Holy Trinity is Haile Selassie I (King), Marcus Garvey (Prophet), and Emmanuel Charles Edwards (Priest), together representing the three divine vocations of man. It would seem that this teaching implies that Jah has taken human form several times throughout history. Priest Kassa, if you're reading this, would you mind weighing in on this matter? Until then, enjoy the honorable priest's music. Jah bless.